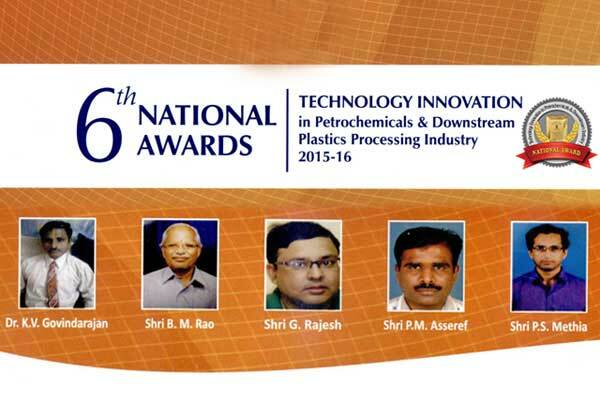 NEW DELHI: The Union Minister of Chemicals and Fertilizers, Shri Ananth Kumar presented the 6th National Awards for Technology in Innovation in Petrochemicals and downstream Plastics Processing Industry on 20th January 2016, in New Delhi. Dr. KV Govindarajan, Shri BM Rao & Shri G. Rajesh from BrahMos Aerospace, Hyderabad, along with PM Asseref from Advanced Systems Laboratory, Hyderabad and Shri PS Methia from Defence Research Development Laboratory, Hyderabad received the prestigious award, for their 'Innovation in Polymeric Materials', titled: "Special Thermal Protection Low Molecular Weight Polymethylphenyl Silicone Rubber with Chopped Carbon Fibre Reinforcement Polymeric Material for Aerospace & Missile Applications", from Minister of Chemicals & Fertilizers, Shri Ananth Kumar in New Delhi. This innovation deals with the development and successful use of thermal protective material on the aluminium airframe in supersonic cruise missile (BRAHMOS) imparting insulation characteristics to the structure and protecting the payload without increasing the weight of the system. The scope of the material could be expanded to fabricate light weight thermal protecting applications in Aircraft/ Missile/ Space industries. M/s Anabond Ltd, Chennai has been chosen as an industry partner for bulk production of this thermal protection material in India. Complementing the awardees, Shri Ananth Kumar said that there is so much talent in the country in the sector, and there is need to harness, map and support them so that there are more innovations, and Research and Development activities. He said that considering the huge requirement of skilled manpower in the petrochemical sector, the Government has decided to set up 100 CIPETs (Central Institutes for Plastic Engineering and Technology), as per PIB news report. The Minister of State for Chemicals and Fertilizers, Shri Hansraj Gangaram Ahir was also present in the function. Central Institute of Plastics Engineering and Technology (CIPET), an autonomous organisation under Department of Chemicals and Petrochemicals, implements the scheme of the national awards. For the sixth national awards, 264 nominations were received, 17 of which have been selected as winners and 14 as runners up for 2015-16.